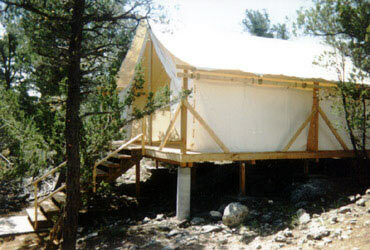 Panther Primitives - Scouting Tents - The Best Tents in History! For many years Panther has been saving Boy Scout and Girl Scout Councils lots of money on their tentage. Because every Panther tent is made right here, in our own factory in West Virginia, there aren't any commissions added for jobbers, wholesalers or salesmen. Buying factory direct gives our Scout customers the very best prices on quality tentage. An all time favorite! Panther platform tents are rugged in design and performance to fit the demands of a camp setting. We've designed special reinforcements for high stress areas, a result of years of experience and feedback from camps. From the tightly woven army duck right down to the rolled ring, spur washer brass grommets, only the highest quality ingredients go into our tents. These are available in six standard sizes and four different canvasses. 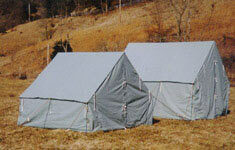 Because they're factory direct our platform wall tents have the best prices anywhere! Extra peak and ridge line reinforcements are two of the standard features that set our scout wall tents apart from the others. Made of 11 oz. poly/cotton canvas, treated to resist water and mildew. It meets CPAI-84 flame retardancy specs. Available in pearl gray and light brown in all the normal sizes. Compare our prices! Copyright © 1999 Panther Primitives. All rights reserved.